Alrighty, my friends. You have waited so patiently, and here it is. 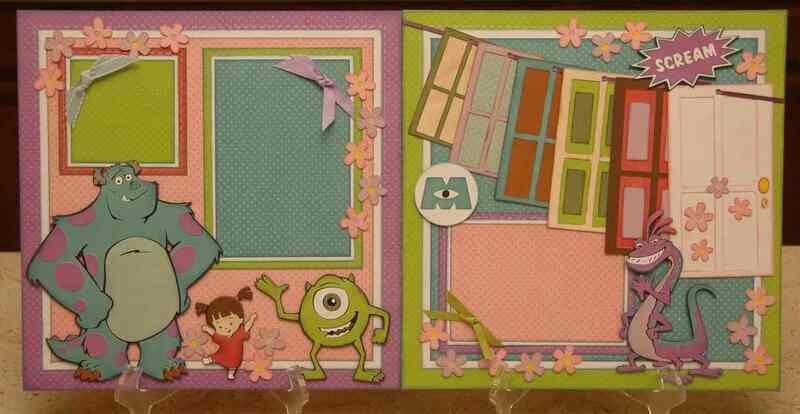 A layout based on my very favorite Disney movie - Monsters, Inc.!! This layout would obviously by perfect for pictures you may have taken at the Disney parks. We have the cutest picture of our daughter standing right in front of Boo's door, and it's going to look adorable on here. 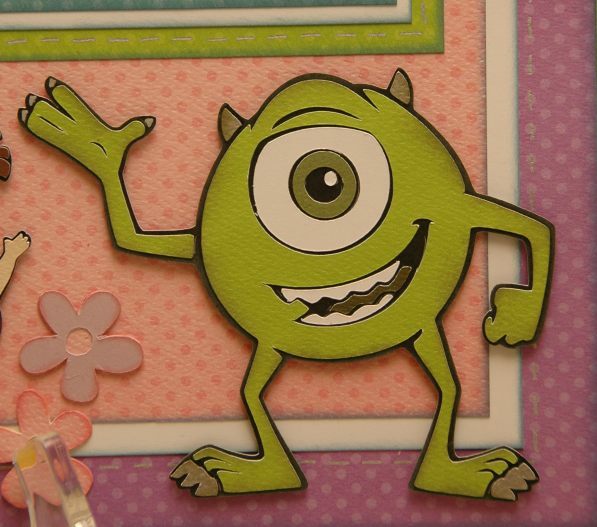 But even if you've never been to the Disney attraction, you could use this to scrap pictures of your sweet little one asleep in their cozy bed, or dressed as a monster for Halloween, having a popcorn party while watching Monsters Inc., or even playing around at the Disney store. This layout was created by yours truly. Due to a new and improved healthy life balance, I'm no longer offering full kits with papers, but I do have full directions available for $5 on the Cricut Kits page. 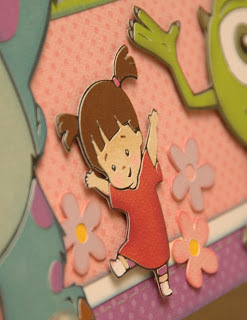 The directions include the Cricut Cut Chart, which shows you exactly what you'll need to cut on your machine with all of the settings, and the cuts are grouped by color to make it nice and efficient. There are also detailed, well-organized written instructions and plenty of large color photographs. 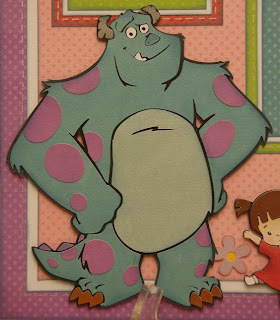 To complete this project as shown, you'll need the following supplies: Cricut Expression®, Best of Pixar cart, Kate’s ABCs cart, various chalk inks (colors I used were Aegean Blue, Pink Petunia, Jumbo Java, Perfect Plumeria, Pretty Petunia, Spanish Olive), 3D pop dots, silver gel pen, white gel pen, brown pen, Crop-a-dial or small hole punch, tweezers and/or good dexterity, scotch tape, plus basic tools and adhesive. You’ll also need ribbon (I used narrow medium purple ribbon to hang the doors, plus 3 colors of ¼” grosgrain ribbon: bright green, lavender and soft blue). Plus, of course you'll need various colors of cardstock. To get these directions (or choose from a zillion others), just pop over to our Cricut Kits page, and it's right at the top. Directions are $5, and if you checkout with PayPal, it'll automatically send you a link to download the directions right away. Google checkout is also available, but since I process those by hand, it may take upto a day to send you the directions. What Disney or Pixar theme would you like to see next??? 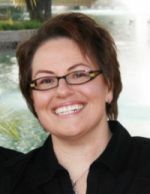 If you have any questions at all, you are welcome to email me at moniquegriffith@yahoo.com. It's been ages since I've posted anything here, so I thought I'd test this out to see if y'all still get notified when I do post. Fingers crossed! 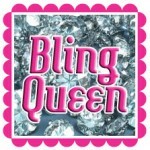 Sooooo, be on the lookout very soon for my newest layout. 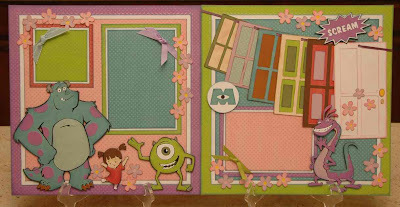 I've just finished a Monster's Inc. layout, and am writing directions for it so that I'll be able to make them available here on the website soon. If there seems to be a continued demand for Disney layouts, I may wind up doing a few more (directions only - no full kits). Let me know what ya think. I would love to hear what you all have been upto lately. Around here, life has been crazy busy, but in a good way. I've been focusing on my family and my workouts. Get this - I'm already signed up for a whole bunch of races this year, including a half marathon, various 5k runs, and a couple of triathlons! And I'm happy to report that I've been doing plenty of scrapbooking, but doing it for fun for my own family albums. Take care, and I'll be posting again soon when the Monsters, Inc. directions are ready!